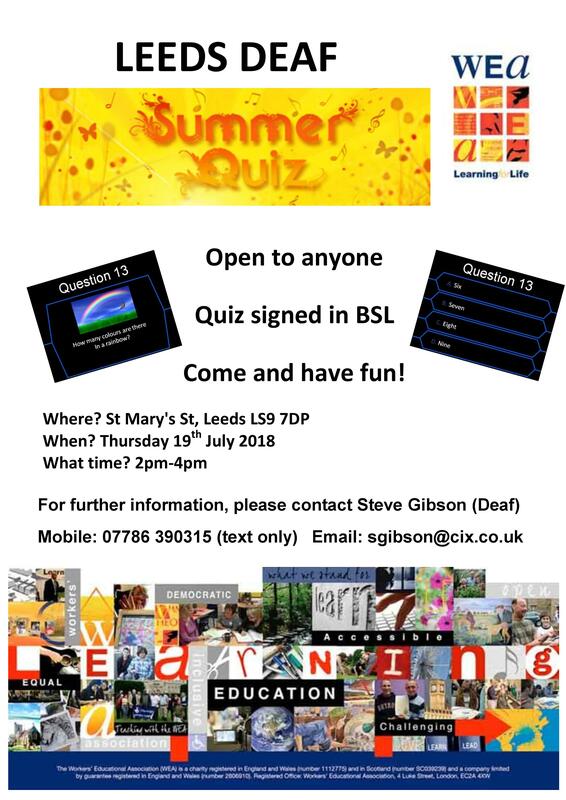 Come and have lots of Fun! Due to a clash in scheduling the fitness class has now been cancelled. we are hoping to re-schedule the class to an evening, more news to follow. Support a charitable organisation of your choice by starting your shopping at smile.amazon.co.uk. Your shopping will support The Leeds Society For Deaf And Blind People, click here to sign up. Collaborating with Blind In Business we are bringing you a day of handy hints and tips and invaluable networking, to help you in your pursuit of employment. The day will provide information on the access to work application process, useful technology in the workplace, when and how to disclose your disability and ideas for successful CV writing. You will also have the opportunity to undertake a mock interview with some of the UK’s top employers to help provide feedback on how to approach the real thing. Alongside all of this there will be inspirational employers and employees sharing their stories of finding employment. To book onto the event, please click here to visit our Eventbrite page where you will be asked a couple of questions about dietary or access requirements. Or please call the connect team on 0303 1234 55 55 and they will be happy to register you onto the event. We only have 55 places on the day, so please don’t hesitate to book. Thank you very much for taking the time to learn about this event. After several years where the blind and visually impaired people of Leeds and surrounding area, have been deprived of local news in a recorded format for individuals, a new talking newspaper has been started. The national Talking News Federation had noticed the absence of a TN in Leeds, despite that city being one of the most revered and highly populated in the North of England. They asked their Development Team, headed by Alan Dunderdale and assisted by Marjorie Dunderdale, to try to set up a new talking newspaper and Alan set about writing to over 50 organisations, societies and companies in and around Leeds, inviting them to take part in this new venture and attend a meeting in November. The meeting took place but sadly, despite promised interest, only a handful of volunteers attended. A second meeting was arranged for January and a different handful of volunteers attended. The third meeting, which took place on March 14th at the John Lewis Community Hub, attracted a few more volunteers and from those attending, a steering committee was formed. Staff at John Lewis, motivated by and including Bryony Hewetson, have played a big part with their enthusiasm as has a volunteer from Yorkshire Water, Ash Roberts. Paul Landey is a committee member of the former Leeds TN and is already providing an essential service in spreading the word about the new venture. Two former readers for the previous Leeds TN have volunteered their services and another member of John Lewis Staff has expressed an interest in reading. Alan Dunderdale has already spoken to a website developer in Otley – Elementary Digital – and this website has been donated by that company to help raise awareness of the new TN. Many thanks for the donation. In the coming weeks we need to establish a listenership and we would ask anyone who knows a blind or visually impaired person to inform them about the new TN and ask them to make contact to be put on the register of recipients. The telephone number to ring is: 07564 368453 – this will be an answer phone – please leave a message with your name and contact telephone number and we will ring you back. We have attached a copy of the magazine section for you to enjoy. A Night to Remember will be a wonderful evening of celebration and remembrance to mark the 40th Anniversary of St Gemma’s Hospice. The Hospice is really proud to have been providing exceptional care and compassion to people since 1978 and proud that the generous support from the Leeds community has made it possible. Special guests, ITV’s Duncan Wood and Christine Talbot, will be hosting the evening and there will be spectacular performances from Leeds Symphony Orchestra and our brand new Hospice Choir. There will also be the chance to learn about the history of the Hospice and hear from those who have been supported by St Gemma’s over the years. The evening will end with a moment’s silence to remember loved ones who are no longer with us. A beautiful cascade of 50,000 petals will then fall in a powerful finale, each one symbolising someone who has been cared for by the Hospice in the last 40 years. Join us for this incredible night for just £5 per person, including a complementary programme. Contact Emily on 0113 218 5550 or click here to purchase your ticket today. Tickets are only £5 per person, including a free programme. They can be purchased from events.st-gemma.co.uk/events/a-night-to-remember-2018 or by calling Emily on 0113 218 5550. Jacki Pritchard – Independent Social Worker/Hypnotherapist/Trainer/Consultant/Researcher. Author and Series Editor: Good Practice in Health, Social Care and Criminal Justice Series. Founder of: Beyond Existing, Support Groups for Adults Who Have Been Abused. Co-Founder of: Practitioner Alliance Against Abuse of Vulnerable Adults (PAVA). 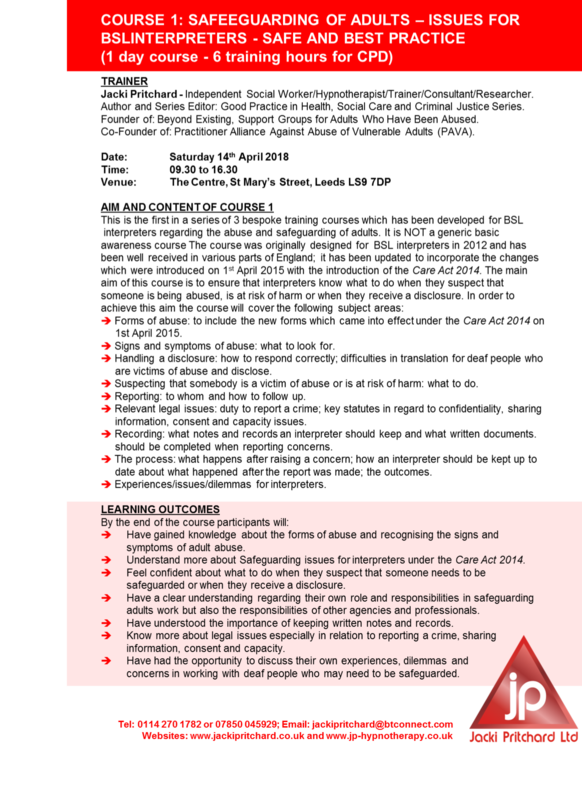 This is the first in a series of 3 bespoke training courses which has been developed for BSL interpreters regarding the abuse and safeguarding of adults. It is NOT a generic basic awareness course The course was originally designed for BSL interpreters in 2012 and has been well received in various parts of England; it has been updated to incorporate the changes which were introduced on 1st April 2015 with the introduction of the Care Act 2014. The main aim of this course is to ensure that interpreters know what to do when they suspect that someone is being abused, is at risk of harm or when they receive a disclosure. Please contact Alison Miller to book a place on the the course. The idea of the day is to carousel around different facilitated groups discussing certain professional or practical interpreting dilemmas through scenarios and how one would resolve these. We want this to be an enjoyable day, to get together, socialise, share ideas and look at different perspectives whilst considering the codes of conduct and the code of ethics in a safe, supportive environment. Finishing off with a plenary session the day will hopefully give us more insight and reflection shaping how practice moving forward both as individuals and collectively. The day will be worth structured 6 CPD hours – the more interpreters attend the richer the experience! 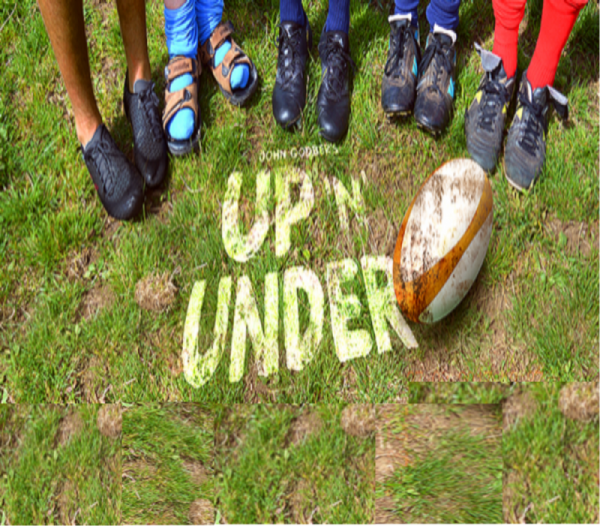 John Godber’s award winning comedy, Up ’n’ Under, will see a cast of Deaf and hearing actors use BSL and spoken English to bring fingersmiths’ exciting visual and physical theatre style back to the stage. The Wheatsheaf Arms rugby team, the laughing stock of Castlefords Amateur Rugby League Seven a Side tournament without winning a game. They don’t have enough players and spend more time in the pub than on the pitch. With just 5 weeks to go, our hero coach Arthur has to improve the team to beat the mighty Cobbler’s Arms, but first he has to work out how to communicate with his players…. When: Wednesday 21st February – Saturday 24th February. Where: Harrogate Theatre, 6 Oxford Steet, Harrogate HG1 1QF. In partnership with England Deaf Rugby Union. Orphaned at a young age and cruelly treated by her Aunt, Jane Eyre is a plain but intelligent child who grows up knowing little kindness. Sent away to a charitable school, Jane later accepts a position as a Governess at Thornfield, a gentleman’s manor whose master is the dark and impassioned Mr Rochester. In spite of their social differences, an unlikely bond grows between the pair but as their romance develops, it becomes clear that Mr Rochester has a hidden past that threatens to ruin them both. With choreography by Cathy Marston and an original score by Philip Feeney, join us this Autumn as Northern Ballet’s brilliant dance actors bring this tale of romance, jealousy and dark secrets to life. Our audio described performance access days enable visually impaired patrons to enjoy a range of activities that enhance the enjoyment and understanding of ballet. The day consists of Touch Tour Insight, which introduces elements of the production to aide in your understanding of the show. You will hear a description of the scenery, feel the props and costumes, and discover the shapes and quality of the movement from the ballet with the aid of Company dancers. The audio described performance, described by VocalEyes, enables patrons to enjoy the story of the ballet and the emotion and quality of movement accompanied by live music from Northern Ballet Sinfonia. Northern Ballet’s production of Jane Eyre will be performed at Leeds Grand Theatre from Wednesday 7 March – Wednesday 14 March. The audio described performance will take place on Saturday 10 March. The Touch Tour Insight will take place from 12.00pm – 1.15pm and is free to visually impaired patrons and your companion. The audio described performance starts at 2.30pm. A limited number of tickets are available at £12 per person for users of the audio description service. Tickets will be priced at £50 per person thereafter. Booking fees may apply. For more information or to book tickets, please call the theatre Box Office on 0844 848 2700. Please make sure you inform the Box Office that you are booking for an audio described performance and let them know if you wish to attend the Touch Tour Insight, as it’s useful for us to know how many people to expect and also of any access needs you may have. For more information about Northern Ballet’s productions, audio described performances or to join our mailing list, please contact the Northern Ballet Learning department on 0113 220 8000.